Ultra-thin sheets of chocolate are transformed into topographic works of art that taste just as good as they look. The project is a result of a collaboration between architect-turned-pastry chef Dinara Kasko and Miami-based artist José Margulis. Margulis, who works with geometric abstractionism and kinetic art, created the initial patterns of what would eventually become edible sheets of chocolate using colorful 3D plastic sheets. Margulis focused on curved shapes with various volumetric geometries, transparencies and intense colors to create a rich, layered effect. “Margulis’s utmost concern is the creation of geometric shapes conceived mostly by changing the perspective of the viewer accompanied by the philosophical notion that everything in life has diverse levels of narrative and spatial perceptions,” wrote Kasko in a blog post. 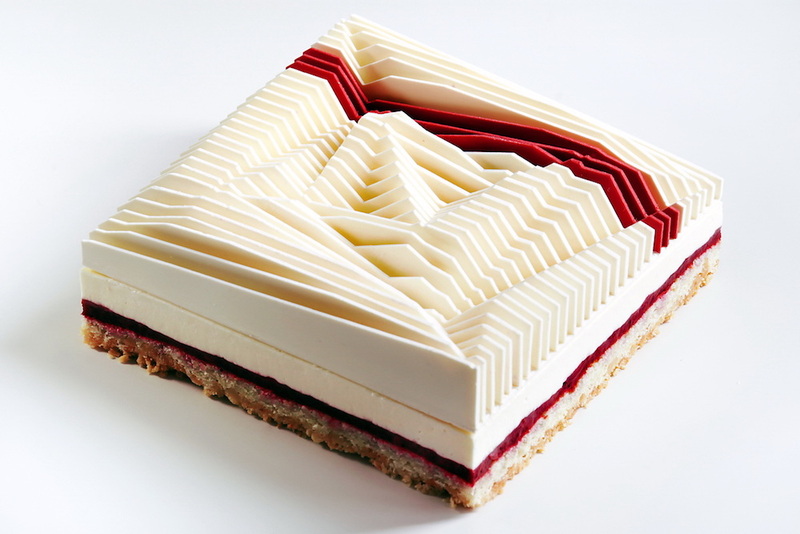 The chef then took Margulis’s initial designs and transformed them into edible treats using various cutting machines and tools to create 3D chocolate layers. These layers were then placed on top of four different flavored tart cakes, including blackberry-blueberry and cherry confit almond sponge cakes.